Sri Advaita Acharya was born in 1434 in Nabagram, Bengal to Sri Kubera Pandit and Srimati Nabha devi. They were originally inhabitants of Nabagram village near Sri Hatta, but later moved to Santipura on the banks of the Ganga. When Sri Advaita Acharya made His appearance in this world, Srila Madhavendra Puri, Sri Ishvar Puri, Sachi Mata and Sri Jagannatha Mishra also made their advent. Sri Advaita Acharya was a disciple of Srila Madhavendra Puri and is one of the chief figures amongst the Panchatattva – Sri Krishna Chaitanya, Prabhu Nityananda, Sri Advaita, Gadadhara and Srivasa. Sri Advaita Acharya studied the Vedas and other scriptures under a scholar named Santacharya in Phulavati village near Santipura, where He was awarded the title ‘Acharya’. Before the appearance of Sri Gauranga Mahaprabhu, all the Vaishnava devotees in the Navadweep are used to gather at the house of Advaita Acharya. In these meetings, Advaita Acharya preached on the basis of the Bhagavad-gita and Srimad Bhagavatam. The devotees took pleasure in Krishna Katha, worshipping Krishna and chanting the Lord’s names. Sri Chaitanya’s elder brother, Vishvarupa used to regularly visit Advaita Acharya’s house to engage in the chanting and dancing of nama sankirtan. Advaita Acharya spent most of His adult life in Santipura with His wife and family, where He was a respected leader of the small Vaishnava community; encouraging everyone to follow the path of bhakti – loving service to Sri Krishna. Seeing all around Him the growing tendency of people to abandon their spiritual practices for the pursuit of wealth and short-lived materialistic gains, Advaita Acharya was greatly pained. Advaita Acharya prayed to the Lord for several months – He worshipped His shaligram shilas lovingly with sacred tulasi leaves and Ganges water calling out to the Lord to manifest and show a way to the worldly people to reach the eternal spiritual abode. By the momentum of His spiritual fervor, His loud cries pierced the coverings of the material universe and echoing through the transcendental Vaikuntha lokas, reached the ears of Sri Krishna in Goloka. Sri Krishna then advented Himself as Sri Krishna Chaitanya in Mayapur, Bengal as the son of Sri Jagannatha Mishra and Sachi Devi. When His parents, Kubera Pandit and Nabha Devi disappeared, Advaita Acharya went to Gaya to perform their pinda daan ceremonies and continued on a pilgrimage tour of the holy places in India. 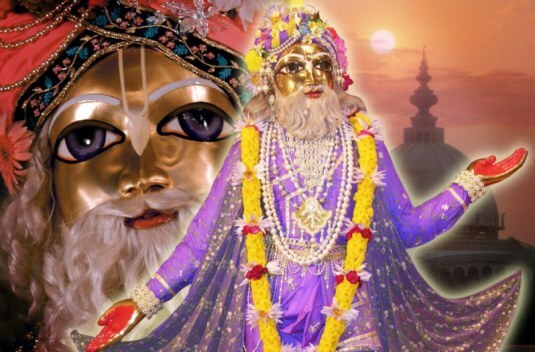 He came to Vrindavan and became absorbed in the worship of Krishna. He discovered the Deity of Sri Madan Mohan / Madan Gopal which He later entrusted to the care of a Choube brahmin in Mathura before continuing on His pilgrimage. Sri Advaita Acharya had two wives; Sri and Sita. In the Gaura-ganoddesha-dipika, it is written that the divine Yogamaya took the form of Advaita’s wife Srimati Sita devi, and that Sri is her prakasha – expansion. Sri Advaita Acharya disappeared in the year 1559, at the age of 125 years. The Narasimha shaligram shila and Deities made in the image of Sri Sri Madan-Gopal that were worshiped by Sri Advaita Acharya are still to be found at Santipura in Madan-Gopal Para. The place on the banks of the Ganga where Sri Advaita Acharya worshiped the shaligram shila and called out to the Lord to descend to the world is known today as Babla. A temple has been built in memory of Advaita Acharya’s pastimes there. This entry was posted in Advaita Acharya and tagged appearance day of Advaita Acharya, Babla, Nabagram, Navadweep, Santipura, songs of the vaisnava acharyas, Sri Advaita Acharya, Sri Kubera Pandit, Srimati Nabha devi, vaisnava. Bookmark the permalink.